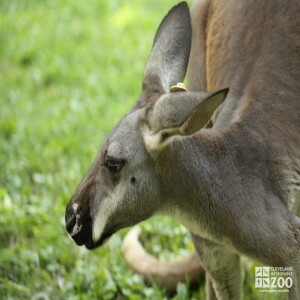 The range of the western gray kangaroo is New South Wales, Victoria, south & west Australia. Western gray kangaroos inhabit forests and woodlands, where there is heavy cover. Gestation in western gray kangaroos lasts approximately 30 days. Litter size for western gray kangaroos is 1. Western gray kangaroos are primarily crepuscular or nocturnal, feeding from late afternoon to early morning and resting during the day. Sometimes they do move around in daylight. When moving slowly, as in grazing or browsing, these animals exhibit an unusual “five-footed” gait, balancing on their tail and forearms while swinging their hind legs forward, then bringing their arms and tail upward. They are remarkably developed in the leaping mode of progression. At a slow pace the leaps usually measure 4 to 6 feet, while at increased speeds they may leap 30 feet or more. Normally they do not jump higher than 5 feet. Speeds of about 30 miles per hour are probably attained for short distances when they are pressed in relatively open country. They can exist for long periods without water. They appear in organized groups called ‘mobs’. Members of adjacent mobs mingle peaceably in overlap zones, but keep mainly to their own undefended ranges. Within each mob males establish a dominance hierarchy through ritualized bouts of pawing, which does not cause injury. Larger males are dominant over smaller ones. This hierarchy functions to determine access to estrous females, and ensures that the fathering of offspring is limited to higher-ranking adult males. Courtship of western gray kangaroos involves wild chasing of females by males. Females are polyestrous., with lengthy reproductive seasons, but brief intervals of receptivity, sometimes lasting only a few hours. Young are produced continually when there is adequate rainfall and forage, but may cease during a prolonged drought. In the wild they breed mainly from September to March. Average age at first emergence from the pouch is about 298 days. Lactation usually exceeds 18 months. Males generally become sexually mature at about 29 months, and females at between 20 and 36 months. Herbivorous, mainly grazers. Primary food is grass.